First (1st) in The Old West Series - Pony Express Rider - Handcrafted - Dated 1998 - Sculpted by Duane Unruh. QX6323. In its brief 18 months of existence, the Pony Express rode into our history and our imagination. Riders as young as eleven years old relayed precious letters and news form Missouri to California. The 1966-mile route included 190 stations and required 10 days. The service ended in 1861, when telegraph lines were completed. 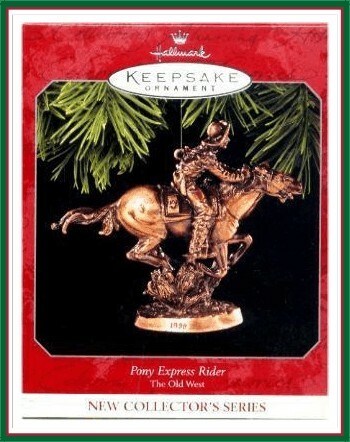 This series of Hallmark Ornaments recalls the spirit of adventure that thrived in the American West. Future years brought other legendary characters whose courage, ingenuity, and dreams of new beginnings have become part of our heritage.